If your warehouse, distribution, manufacturing, or reselling company depends on rugged mobile devices to enhance productivity, decrease errors, and improve customer satisfaction you know how important it is to get the right tool for the right job.And let’s face it, if you’re still using yesterday’s cumbersome and error-prone legacy Terminal Emulation (TE) green screens, you already know that they should be replaced and/or upgraded. 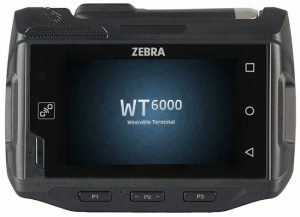 And since Zebra is offering special pricing on its new WT6000, trade-in promotions and service discounts until April 2018, there’s simply no good reason to wait any longer. Revolutionary operator interface with no host changes. The WT6000 is equipped with an integrated tool that allows us to transform your legacy TE “green screens” into beautifully designed, graphics-based all-touch TE screens in hours, not days or weeks. 14% productivity increase. The WT6000’s intuitive, all-touch screen means data input is faster and errors are less likely, which substantially increases employee productivity. Zebra’s multi-modal speech-directed input increases worker productivity by 15% – with 39% fewer errors than typical speech-only wearables. Up-to-the-minute features. You scan faster; scan longer; scan more accurately; and scan more safely because the WT6000 comes with enterprise-class security and device management and data capture capabilities. Compact size – 27% lighter and 34% less volume. Its breakthrough ergonomic design is smaller than prior generation Zebra wearable devices, bringing unprecedented comfort to industrial wearable computing. Simply put, the WT6000 is the only wearable mobile computer that literally does it all. Simply put, the WT6000 wearable mobile computer does it all.